In building up Kalakshetra, Rukmini Devi used her immense talent for persuading others to share her vision and dedicate themselves to the institution. Using this talent, she brought to Kalakshetra great artists like Tiger Varadachariar, his brother K. Krishnamachariar, Mylapore Gowriamma, Budalur Krishnamurthy Sastrigal, Mysore Vasudevachar and Karaikudi Samabasiva Iyer. All these were stalwarts. Only one who later became a pillar at this temple of arts was virtually a beginner when she entered its portals. It was S Sarada, known within the campus as Peria Sarada, to distinguish her from Sarada Hoffman, aka Chinna Sarada, another teacher. When Sarada retired from Kalakshetra in 1985, she was acknowledged as a diligent scholar and a fine teacher, but when she came to Kalakshetra in 1939, she was but a young woman of 24, well acquainted with various works of art and advaita but still a non-entity. Though Sarada had formal education only up to Standard VIII, she had the good fortune to be educated at home by her grandfather, Pandit Subramania Sastri of Tanjavur. She studied with him the Sanskrit plays of Kalidasa, works like Kuvalayakandam and Siddhanta Kaumudi. She assisted him in reading the proofs of works on music, natya and Vedanta, both in Sanskrit and in Tamil. She also read the Yogavasishtha and the Gita with the commentaries of Sankara, Ramanuja and Madhwa. Her grandfather used to ask her to repeat the Dakshinamoorthy sloka which made her understand the advaita philosophy better. Sarada's grandmother Lakshmi Ammal was also a learned lady from whom she got an insight into her cultural heritage. She learnt the violin initially and later on the veena as well from her mother Meenakshi who was a talented musician and a good vocalist. Sarada's interest in dance began when her grandfather brought home paintings from the Saraswati Mahal Library in Tanjavur. She was fascinated by the postures of the dancers. On one occasion, as a youngster, she happened to watch a dance recital hiding behind stone pillars; the similarity between the pictures and dance movements seemed to leap out at her. Nonetheless the young girl never dreamt that she would become a dance guru one day, because she understood dance was only for devadasi-s, not for respectable family girls. In her book entitled 'Kalakshetra-Rukmini Devi,' Sarada has vividly recollected her first impression of Rukmini Devi thus: "When I first saw Rukmini Devi at the pandal of the Music Academy's general session in 1934, I was stunned by her striking personality... Rukmini Devi had come to witness a dance performance and I was watching Rukmini Devi! After a few days I attended a Theosophical Convention meeting at the Theosophical Society... I saw Rukmini Devi for a few minutes. The fascination I felt for her persisted, even after I returned home to Tanjavur." Sarada witnessed Rukmini Devi's first performance of Bharatanatyam when she attended the Diamond Jubilee Convention of the Theosophical Society in 1935. Just before this, some members of the Theosophical Society said that, considering she was the wife of the President of the Theosophical Society and a pupil of Dr. Besant, the fact that she had taken to this dance might bring a bad name to the Society. But Sarada shared her grandfather's view that this would not happen. She was especially impressed by the dance to the padam Manchi dinamu neday and by the costume she wore which "resembled the garments etched in the sculptures of dances in our temples." When Pandit Subramania Sastri came to work in the Adyar Library in 1939, Dr. G S Arundale asked him to bring his wife and granddaughter with him to Adyar. Thus Sarada, who lived in seclusion in Tanjavur, was suddenly transplanted into a cosmopolitan society. Sarada and her grandparents came to Adyar on 17 February 1937 which was Adyar Day. The International Centre for Arts, as Kalakshetra was called then, had been established on 6 January 1936. Subramania Sastri went there everyday. One day a meeting was held to choose an Indian name for registering it and Sastri too attended it. Various names were suggested but Rukmini Devi was not satisfied with any of them, but when Subramania Sastri suggested that the institution be called Kalakshetra, Dr. Arundale and others present accepted immediately. Once, in August 1939, Sarada was asked to come with her grandfather to attend a private music concert of Papanasam Sivan. After the concert Rukmini Devi told her that she should come every day to Kalakshetra with her grandfather. During these visits, Sarada attended Rukmini Devi's dance rehearsals. One day an idea struck her: why not try to write down the dance? To quote her: "Since I knew music notation, I wrote out the song Ananda natana prakasam of Dikshitar with music notation, and underneath I wrote the gesture names, and beneath the swara-s and the adavu names synchronizing it with the tala thereof." After some time, Rukmini Devi asked her what she was up to and when Sarada showed her what she had written, she laughed and asked, "How can dance be learnt by notation?" But Rukmini Devi had herself written down the abhinaya parts in sentences and the adavu-s with line pictures to show the form, but not in exact musical notation nor with the exact tala markings. Writing down the dance was the inspirational work of Sarada and her method is still followed in Kalakshetra and also accepted widely elsewhere. Sarada slowly involved herself in the activities of Kalakshetra. She received much encouragement and guidance from Rukmini Devi who brought out all that was best in the shy young lady. She attended Bharatanatyam classes with Rukmini Devi's niece Radha Sriram (later Radha Burnier). She took Sanskrit classes for junior students and sometimes the veena classes when the teacher was absent. She attended the music classes of Kalidas Neelakanta Iyer, whose special forte was intricate tala. When Rukmini Devi was learning a ragamalika varnam from Pandanallur Meenakshisundaram Pillai, Sarada also attended the class. He taught the straight gesture sequences for the word-for-word meaning. During this time Kattumannarkoil Muthukumara Pillai and Pandanallur Meenakshisundaram Pillai taught at Kalakshetra occasionally, while Chockalingam Pillai was teaching regularly. Meenakshisundaram Pillai taught Sarada how to recite the teermanam-s, the 35 tala-s and the sollukattu-s; and the famous mridanga vidwan Bhairavan Pillai taught her how to use the tattukazhi and its tala-s. These helped her to do nattuvangam and sing along with others for the very first public performance of Rukmini Devi. In the event, she became an honorary worker in the dance and music department of Kalakshetra in 1939 and became the Head of the Dance Department in 1940. When the Kalakshetra troupe went on education and cultural tour of South India, it presented art programs in different places; even Sarada took part in a dance-drama, Samudra Varnana. In Ootacamund, it was suggested that Sarada and Padmasani, one of her senior colleagues, should sing with Chockalingam Pillai and his son Subbarayan for Rukmini Devi’s dance recital there. Came a time when none of the traditional nattuvanar-s were teaching at Kalakshetra. Then Rukmini Devi, Radha Sriram and Sarada began to take the dance classes. Sankara Menon told Sarada casually one day that she should teach the alankara sastra, that is the nayika-nayaka bhava, rasa-s, etc. Sarada, Sriram and Radha were already preparing a practical lesson on the usages and gesticulations of the asamyuta and samyuta hasta-s, in accordance with the traditional way of depicting the usages (viniyoga) and they were teaching it in the 'theory' classes. After Radha left Kalakshetra, Sarada continued with preparing practical lessons for the mandala-s, turns, jumps, etc., as described in the Abhinaya Darpana, correlating theory with practice. Sarada chose the Pratapa Rudriyam for this because its sloka-s were in simple Sanskrit. She taught the relevant sloka-s for the nayaka-nayika bhava, as well as for rasa-s, and prepared a chart to explain the bhava-s, determinants, consequents and the different sets of bhava which are transformed as rasa-s or sentiments. While it was Rukmini Devi who determined what the dance repertoire for each set of students should be, according to his or her ability to learn and individual standard in nritta, abhinaya, etc., it fell to Sarada to teach the students the selected songs. Sarada was popular as a dance teacher because she taught through persuasion. She was given the Kalakshetra post-graduate diploma as dance teacher in 1961 at its silver jubilee convocation; she drafted the syllabus for teaching dance theory, she was a member of the Government of India Scholarships Committee for dance and also an examiner in the subject on the panel of different universities in India. Her contribution to Bharatanatyam as a guru was recognized by the Sangeet Natak Akademi with an award in 1984. Sarada had helped Rukmini Devi from the very first dance-drama produced by her, namely Kutrala Kuravanji. Later she edited the material for all of Kalakshetra's dance-dramas along with Venkatachala Sastry and Adi Narayana Sarma of the Besant Culture Centre. Stalwarts like Tiger Varadachariar, Veena Krishnamachariar, Papanasam Sivan and others composed music for the various dance-dramas. Among her numerous scholarly achievements is her assistance to Tiger Varadachariar when he was composing music for Kumarasambhavam, Papanasam Sivan for Andal Charitram, Kannappar Kuravanji, Gita Govindam, Sakuntalam, Matsya Avataram and Kurma Avataram. She also worked with Balu Bhagavatar of Melattur and with Kalyaniammal and corrected and edited Dhruva Charitra, Usha Parinayam and Rukmini Kalyanam and made it suitable for presentation by Rukmini Devi. She helped edit and proof-read music publications of Papanasam Sivan, Veena Krishnamachariar and others. She also helped edit the musical works of Neelakanta Sivan, the Keertana Malai of Papanasam Sivan and Gana Manjari, the works of Veena Krishnamachariar, all of which have been published by Kalakshetra. She helped edit the three volumes of the Sangeeta Ratnakara and the Mela Ragamalika, both in Sanskrit, published by the Adyar Library and Research Centre. 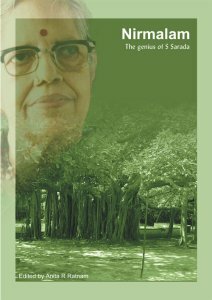 Sarada wrote, too, the biography of Rukmini Devi cited earlier, published by the Kala Mandir Trust. Her association with Kalakshetra gave Sarada a visa to travel abroad. She attended, as an invited delegate, the conference on traditional dance-dramas of South East Asia in Kuala Lumpur in Malaysia, when she presented a paper on South Indian Dance Dramas from Ancient to Modern Times, and she visited Europe and the United States, and gave talks on the spiritual background of Indian dance, Indian culture, Indian music, etc. For all her closeness to Rukmini Devi, Sarada aligned herself with S Guhan and S Lakshmanan, members of the Executive Committee of Kalakshetra, who demanded greater accountability from the management of the institution than they could obtain from it. Guhan, Lakshmanan and Sarada together filed a suit in the High Court of Madras which, in the event, found for them. Rukmini Devi passed away shortly afterwards. Interestingly, this passage-at-arms did not seem in any way to diminish Sarada's admiration for Rukmini Devi as an artist. 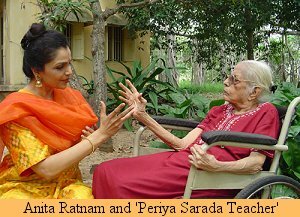 In retirement, Sarada gave practical Bharatanatyam classes for those completing their post-graduate studies. She was also an honorary worker at the Adyar Library. It is wrong, Sarada says, to say that Kalakshetra dance-dramas avoided sringara, packed, as they are with nayika-nayaka bhava, but they are not 'vulgar.' On a trip to Mysore, when she saw Krishna depicted as a lusty lover, she was so shocked that she wanted to throw up. Fortunately, she added humorously, she had cloves and cardamoms in her bag and quietly chewed on them. Students of Kalakshetra who were taught by Sarada also include Yamini Krishnamurthi, V P Dhananjayan, Sarada Hoffman, Anjali Mehr, C V Chandrasekhar, Shanta Dhananjayan, Adyar Lakshman, Krishnaveni Lakshmanan and Leela Samson. When she completed 80 years of age, she was honoured by Bharata Kalanjali and the Kalakshetra Graduates Association at a function held at Bharatiya Vidya Bhavan in Madras. The warm tributes paid to her showed that she is held both in high esteem and affectionate regard. She is in the winter of her life but she must have felt only contentment. G Sundari was a member of Kalakshetra's Executive Committee for a number of years and also assistant editor of the Kalakshetra Quarterly. She used to handle public relations. 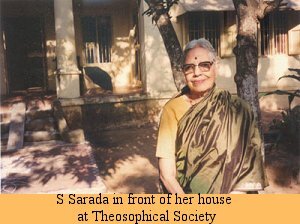 Sundari retired in 1989 and continues to do publicity for the Theosophical Society. Sundari is Sarada's companion and friend for many years and has been taking care of her till date.